Synopsis: In what is hopefully the last movie in this franchise, the "Wolfpack" has to hand over Leslie Chow for a criminal boss. THE HANGOVER is still one of the funniest movies from the past few years. Given that it was such a success, of course they had to make sequels. While I haven't seen the second one, between Jonesy's review and hearing that it was basically a remake, I decided to jump in and just watch the third. And this third entry into the "trilogy," is definitely quite a few notches below the original. Actually, that's being generous. THE HANGOVER III has been one of the worst movie experiences in this last year. While it tries to break away from the formula of the first two, the terrible writing and the unfortunate focus on the two most annoying characters of the franchise make look like a comedy. Chow says something in a really racist accent. Needless reference to the last two movies. Stupid excuse to move to the next location. So that basically sums up the second "act" of the movie. There's very little justification of how anything happens. What's worse is that the "comedy" relies on the two most grating characters, Alan and Chow. And Ken Jeong as Chow....let's just say that Jeong has been doing the same shtick for a long time. Sometimes it's worked (COMMUNITY'S 2nd season), sometimes it hasn't (TRANSFORMERS: DARK OF THE MOON), but this might be the most ridiculous, over-the-top, grating role and performance he's done. He could be a turn off to watching fifth season of Community, if he still ends up as such a big player. The focus on these two is akin to the PIRATES franchise choosing to focus on Sparrow because he was the most popular aspect of the first movie. In both instances, it doesn't work. It's a shame that Cooper and Helms were mostly kept to the sidelines because the first movie really works thanks to the interaction and chemistry of all three leads. What's even crazier is that Todd Phillips seems to be under the impression that he envisioned this is as some sort of end to the trilogy. There was a very weird and awkward sequence that finishes the movie, and you can tell that it's meant to wrap up the series, and yet, there seems to be zero progression for any of the characters. The movie also relied on some weird and rather needless call backs to the first film. The damn plot is started because of a random name said in a throwaway line that got expanded out for the convenience of this film. But the way and the reason that a certain character from the original is brought back my issues with the movie as a whole. The scene only ever so slightly moves the plot along, there's a strange attempt at character development, and some "humor," which is then glossed over to move on to the next scene. What's interesting is that the fact that there are no hangovers in the movie isn't bothersome. Seeing the characters in different situations would have been fun, but if there was maybe some humor or maybe it wasn't so needlessly over-the-top, it could have been an enjoyable experience. A final and rather more personal note, the type of humor that was derived from animals dying constantly during the movie was actually pretty sickening. I'm not a PETA type of vegan or anything like that, but I must admit that animal violence bothers me, and the fact that it happened so often and was used for cheap laughs was a definite turn off. 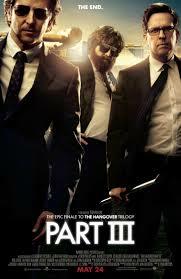 So yes, the HANGOVER was never meant to expand to a trilogy (let's hope it stays at just a trilogy), but it could have handled the transition a little bit. As it stands, if it's down to the wire for some reason, go watch FAST & FURIOUS 6 instead of this movie on opening weekend. None of you want to feel responsible for a fourth movie. Ugh, Jesus. I haven't seen anything since the first one (which in my opinion was a one trick pony) but I don't think I'll see this one either. I'll put it on my mental shelf of movies that don't exist in my mind like Kingdom of The Crystal Skull, Robocop 3 and DIE HARD 4 & 5. good read Javi... good read.